With one race to go in the Accelerate Gritstone Series – Grin & Bear It on 1st Nov- both the men’s and women’s podium places are being hotly contented. 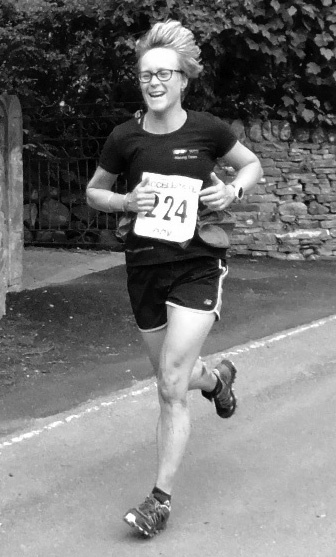 The current ladies leader is Gay Fletcher (pictured at Edale) of Smiley Paces; she has had an amazing consistent series and so far completed every race. I know she is planning on running Grin & Bear it so she will complete every race and almost certainly be in the prizes. Second and third places are two different generations with Pat Goodall of Totley currently lying in 2nd and is completing 60 races in her 60th year and as I write is heading for 100. In third spot is Ellie Crownshaw of Bradfield School, a former Gritty Series winner completing the adult series for the 1st time. She has improved amazingly throughout the series and one to watch for next year and beyond. So who can so can challenge these three? With 4 race to count, there are a number of ladies who have done very well in three events so far, all from local Peak District clubs. From Dark Peak Claire Oliffe and Jane Crowson, Caz Kay from Totley, Zoe Proctor and Emma Gerrad of Pennine all have a chance of challenging the podium spots if they complete Grin & Bear it and do well. Stu Bond, Dark Peak, has already secured a win in the Men’s Sereies, no one can get enough points at Grin & Bear It to challenge him. Steve Franklin, Totley and Martin Dawson are currently 2nd and 3rd respectively. Jonny Crickmore , Dark Peak could challenge for the podium as he had an excellent start to the season. Apparently he is injured at the moment so don’t think he will be at the race. Andrew Wainwright had good runs at Great Hucklow and Salt Cellar and a good run this weekend could see him in a top spot. There is a lot of competition in the vet categories. On current standing in the mens, 4th– 8th place are all held by V40’s with Dark Peaks Graham Moffatt in the lead. Dark Peak are also doing well in the V50’s with a battle going on between Gavin Williams and Andy Barnet, both previous winners. Jeremy Brayshaw, Totley, and Mike Arundale are battling it out for the V60 honours. The women’s V40 is been led by Gay Fletcher, V50 Pat Goodall and V60 Dot Kesterton (Team Accelerate-Scott). 15 miles of peak bog will finally decide the places, it will be a tough one, so you would be advised to ‘Grin and Bear It’.